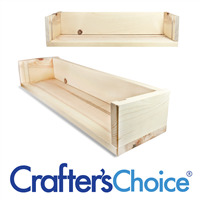 This wooden soap mold has been designed with easy to use slots for removing the sides. Both long sides can be removed from the mold. Make large cold process soap batches with this mold. Loaf Dimensions: 3.75" x 20.56" x 3.5"
Inside Loaf Dimensions: 3.6875" x 20.5" x 3.375"
Style: Loaf Bar Depth: 3.5"
Bar Length: 20.56" Bar Width: 3.75"